Making extra income is the best way to start paying off your debt, put more towards savings, and work towards financial independence. As you can tell, I am a big believer that learning new ways to make money can completely change your future for the better. The crazy thing is that before I learned how to make money through my blog, the idea never even crossed my mind! I didn’t realize side hustles and side businesses were even a thing people did. Actually, when I started my blog, I had no idea that blogs could even make money. Now I wish I had gotten started even sooner. One of the best parts of blogging and learning new ways to make money is that I can share what I’ve learned with all of you. I also love hearing from people who are making money on the side so that they can pay off debt, reach retirement, and more. I’ll be sharing some of their tips and stories here as well. Saving up for big purchases, such as a vacation. Help you to become more diversified with the way that you make money, which will protect you in the future, and more. Making extra money doesn’t have to consume all of your extra time either. You can find new ways to make money with just one extra hour a week. Or, if you are willing to work 40 to 50 hours a week on top of your full-time job, there are even more options when it comes to earning extra money. You can make money online, by creating a side business, with a part-time job, selling your stuff, earning more at your current job, and more! 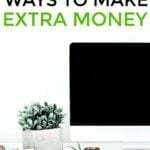 Some people may be skeptical when thinking of ways to make money online, but there are many legitimate online jobs and business ideas where you can earn a full-time living, or at least a side income. Yes, real work from home jobs do exist, and more and more people are doing it these days. Did you know that nearly 4 million Americans now work online? These aren’t just remote jobs either, as many are freelancing online, running their own businesses, and more. I love being able to earn a living online, and it allows me to be location independent and/or work from home. Learning to make money online is how I was able to quit my day job, sell our house, and travel full-time on a sailboat. So, if you are interested in learning ways to make money online, start here. Start a successful blog – The first thing I recommend to anyone interested in learning how to make money online is to start a blog! Blogging is how I earn a living, and just a few years ago, I never thought it would be possible. In fact, before I started my blog, I didn't even know that blogs existed! I currently earn around $100,000 a month with my blog. You can create your own blog here with my easy-to-use tutorial. You can start your blog for as little as $2.95 per month, plus you get a free domain if you sign up through my tutorial. I even have a Free How To Start and Launch A Money-Making Blog Course you can join, and it will help you start and launch a successful blog! Once you start a blog, you can learn how to monetize it with affiliate income and sponsored posts. Run Facebook ads for local businesses – Bobby Hoyt, a former band teacher who now runs the successful website Millennial Money Man, started running Facebook ads for local businesses to help him pay off $40,000 in student loan debt in only 18 months. In our interview you can learn about how Bobby got started, why businesses want to run Facebook ads, and how easy it is to get started. Read the full interview at How To Make $1,000 Extra In Your Spare Time With Facebook. Teach English – Did you know that you may be able to teach English online to children? VIPKID is a company that allows you to work from home, create your own schedule, and earn $18-21 per hour (many teachers are earning over $1,000 per month) all while teaching English online. You don't need a teaching degree, but you do need to have a four year degree in something. This is a great option for anyone who has a passion for teaching and looking for ways to make money online. Answer surveys – Answering surveys online won’t make you rich, but it is one of the ways to make money online that you can put towards your debt payoff or savings goals. Survey companies I recommend include American Consumer Opinion, Swagbucks, Survey Junkie, ProOpinion, Pinecone Research, and Harris Poll Online. These survey companies are free to join and free to use! You get paid to answer surveys and to test products. It’s best to sign up for as many as you can, as that way you can receive the most surveys and make the most money. Create a course and teach others – Before you think that you have nothing to teach, I want to tell you that you most likely do! Online courses are extremely popular right now, and you don't need to have a blog in order to be successful with an online course. I use Teachable for my online course platform, and I highly recommend it. Here's How I’ve Earned $434,698+ From One Online Course Without Webinars Or Spending Money On Advertising. 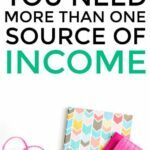 Create an ebook – My friend Abby, from Just a Girl and Her Blog, explains how creating eBooks may be a great source of income source for you. In one year, Abby made over $110,000 from sales of digital products (such as eBooks). 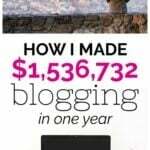 She started four years ago knowing nothing about blogging and she now makes six figures a year, due in large part to her eBooks. She is now teaching others the process she uses to write and launch profitable eBooks, and you guys, it is genius! Learn more at How To Create A Profitable Ebook With Abby Lawson. Edit content – Websites, books, courses, and more all need editors to help them improve the quality of their content. No matter how many times a person reads a piece of content, something will usually slip through. If you’re a grammar-nut, then this can be one of the best ways to make money for you. Manage social media accounts for others – Being a social media manager can be a fun job. Not everyone can do it, but if you have social media skills, then it might be something to look into. It’s not as easy as just sharing random content as you do need to create a strategy that works, but it can turn into a good career if you are successful. Learn more about How I Started a Pinterest Consulting Side Hustle. Use Swagbucks for your online searches – Swagbucks allows me to earn Amazon gift cards with very little work. Swagbucks is just like using Google to do your online searches, except you get rewarded with points called SB for the things you do through their website. Then, when you have enough points called SB, you can redeem them for cash, gift cards, and more. You’ll receive a free $5 bonus just for signing up through my link! Proofread for a living – In just one year, Caitlin made slightly over $43,000 as a freelance proofreader, while also going on several fun vacations. If you are looking for a new job, or just new ways to make money on the side, this may be something to look into. Learn more at Make Money Proofreading By Becoming A Freelance Proofreader. Assist others with improving their resume – A few years ago, I interviewed a reader who ran a resume business. She showed me how others can earn money by helping people create the kind of resumes they need to land their next job. Because having a good resume is an important part of getting the job you want, this is an in demand option. If you are constantly reviewing resumes for your friends because you're so good at creating them, then you may want to turn your skill into a paying job! Post on social media – If you have social media accounts, even just a personal Facebook account, this can be one of the many ways to make money by posting small ads on your account. One popular company that I recommend is Izea. Become a freelance writer – A freelance writer is someone who writes for a number of different clients, such as websites, blogs, magazines, and more. These writers don’t work for one specific company, rather they work for themselves and contract out their writing. Learn more at How To Start A Successful Freelance Writing Career. And, when I was at FinCon this summer, I heard from so many bloggers and online business owners who need freelance writers to help them develop new content. Moderate forums – Some online forums will pay you to moderate their message boards. If there is a forum you visit often, you might want to see if they are hiring. Become a transcriptionist – Do you know what a transcriptionist does? Did you know that it is one of the ways to make money in 2019? 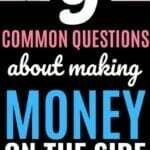 You can read more about how to make money on the side as a transcriptionist at Make Money At Home By Becoming A Transcriptionist. Become a virtual assistant – Virtual assistant tasks may include social media management, formatting and editing blog posts, scheduling appointments or travel, email management, and more. Basically, you get paid to do any task that needs to be done for someone’s business but doesn’t need to be done by them. You can read more about how Kayla is earning $10K per month working from home as a virtual assistant. My sister, Alexis of Fitnancials, has been my virtual assistant for a couple of years now, and it has helped her quit her job to become a full-time blogger. Plus, she is invaluable to me! Become a bookkeeper – Ben, founder of Bookkeeper Business Academy, explains how becoming a bookkeeper may be a possibility for you. Ben helps people start and grow their own online bookkeeping business with his online bookkeeping course. And, guess what? You don’t have to be an accountant or have any previous experience! You can read more about how to make money on the side as a bookkeeper at Make Money At Home By Becoming A Bookkeeper. Start an online store – Did you know that you can create your own online store to make money? Jenn, a reader of mine, started her online business a little over four years ago and since then she has developed and grown three successful online ecommerce stores earning an average of $19,000 per month. Learn more at How Jenn Makes Over $10,000 A Month With Her Online Store In Less Than 10 Hours Per Week. Test websites – This is a relatively new online work at home option that I have heard about. UserTesting.com is a website that pays you to test websites. You get paid $10 for each website you review and test, and $15 per website that you mobile test. You do not need to be a super technical person for this online job, as they want real people to review websites to see what people really think. Create a side business (or a full-time one!) in 2019. Creating a side business is one of the best ways to make money in 2019, and it may even lead to a full-time career. While many people start these businesses on the side of their regular job, most of the people who’s interviews I share in this list have been able to turn their side jobs into full-time businesses. Pick up trash – This might not be the most glamorous option, but did you know that you can get paid $30- $50 an hour to pick up trash? Read Get Paid $30 – $50 Per Hour To Pick Up Trash to learn more. Sell on Amazon – If you want to learn one of the many ways to make money on the side and online, then you may want to start an Amazon FBA business! Jessica Larrew, of The Selling Family, explains how selling on Amazon may be a possibility for you. She is a friend of mine, and I am blown away by her success! In the first year that Jessica’s family ran their Amazon FBA business together, working less than 20 hours a week total, they made over six figures profit! If you are looking for a new job, or even just a side hustle, this may be something that you want to look into. Learn more at How To Work From Home Selling On Amazon FBA. Maintain and clean yards – Yard maintenance is another one of the ways to make money this year. You can make money by mowing lawns, killing/removing weeds, cleaning gutters, raking leaves, and so on. Because every season offers the opportunity for some type of yard maintenance, this can turn into a year round job. House sit – House sitting is becoming more and more popular these days, and there are many websites out there for house sitting. You might not always get paid, but you are often compensated with a nice place to stay. In many cases, you do get paid to watch the house, water the plants, and so on. House sit in a foreign country – House sitting doesn’t just have to be in your own town. It can be something you do while taking amazing vacations. You can read more about it at How We Became Professional House Sitters In Europe & Saved Over $5,000. Rent out your RV – Many RVs sit unused in storage lots, driveways, and backyards, so why not try to make a little extra money while you’re not using your RV? Learn more at How To Make Extra Money By Renting Out Your RV. Walk dogs and/or pet sit for extra money – If you love animals, then this is one of the ways to make money that you may want to look into. Walking dogs and pet sitting can be a lot of fun because who doesn’t love animals!? With this side hustle, you may be going over to your client’s home to check in a few times a day, you may be staying at their house, or the animals may be staying with you. Rover is a great company that you can sign up with in order to become a dog walker and pet sitter. Learn more about this at Rover – A Great Way To Make Money And Play With Animals. Groom pets – This is yet another animal related side business, and it could be a good one for you. With a mobile pet grooming business you will go directly to the pets rather than needing to find and set up a permanent business location. Become a landlord – Whether you rent out a room in your home or start buying up properties to invest in and then rent out, this could be one of the more lucrative ways to make money on the side. Learn more in How This 29 Year Old Is Building A Real Estate Empire. For even more on information about becoming a landlord, check out my interview with Paula Pant of Afford Anything: How This 34 Year Old Owns 7 Rental Homes. Become a cooking instructor – Healthy Hands Cooking is a self-paced cooking instructor certification program that can be completed from the comfort of your home. This is an 11 module course that will help you create your own cooking business with the correct licensing, permits, background checks, food safety regulations, marketing, and more. Healthy Hands Cooking is a movement to fight childhood obesity by empowering adults to teach children about nutrition and healthy cooking through entertaining and informative classes, camps, and birthday parties. If you love to cook, this will be a great way to make extra money this year. Shovel snow – We no longer need to have our snow shoveled, but it was definitely something we didn’t enjoy doing while we were living in St. Louis. If you get snow where you live, then you may be able to knock on your neighbors’ doors to see if they would like their driveways and sidewalks shoveled. If you want to go a little further, you could even invest in a plow and market your services. Babysit and/or nanny children – When I was just 14, I was making $10 an hour babysitting for a neighbor. I babysat 40 hours a week and it was a great way to make extra money! If you have any special skills or can provide extra work, such as cleaning up around the house, teaching the child how to speak another language, picking up the child after activities, and so on, you will most likely be able to charge more than $10 an hour. Become an Uber or Lyft driver – Spending your spare time driving others around can be a great money maker. Read more about this in my post How To Become An Uber Or Lyft Driver. Click here to join Uber and start making money ASAP. I also did a great interview this year with Harry of Rideshare Guy, and he shares his tips for becoming a successful rideshare driver in the interview Want To Be A Rideshare Driver? Tips From The Rideshare Guy. Help people fix things around their home – If you are a handy person, this might be one of the best ways to make money for you. Word of mouth is big when it comes to finding clients, but you can also post your service through Craigslist advertisements, post flyers to bulletin boards around your town, and more. Clean homes – Cleaning is something that many people dread. If you are good at cleaning and enjoy it, then you may be able to find clients who want you to come to their home to clean. This can pay around $20 an hour or more in some areas. Because cleaning for others is such a personal job, you will often find loyal customers who want you to come back over and over again. Move furniture – Moving is another task that many people dislike. Movers can earn a broad range when it comes to hourly pay, but it’s usually somewhere around $25-$50 an hour if you run your own business. Become a photographer – Do you love photography? This could be one of the ways to make money while doing something you love. Learn more at How To Make $25,000 – $45,000 A Year As A New Photographer. Tutor on a subject – Similar to teaching a skill, you may be able to make money by tutoring someone. You could help someone with their homework, help them learn a language, prepare for an important exam, and more. If you are particularly good at a subject, then looking at this as one of the ways to make money might be a really good option for you. Ways to make money on the side with a part-time job. If you’re looking for something a little more permanent than a side hustle, a part-time job might be one of the best ways to make money on the side. There are many part-time jobs that will work with your full-time job’s schedule. You can find a job on sites such as Snagajob, Craigslist (yes, I’ve found a legitimate job through there before), Monster, and so on. Deliver RVs to dealerships – RVs are huge, and the majority of the time they can’t be transported by semi-trucks because of their size. Due to that, someone has to drive them from the manufacturer to the RV dealership. We met a couple who did this for a living, and they both loved what they did. They were able to travel a lot, earn a living, and got to see new RVs all the time. To make extra income doing this, you can contact transport companies in your area, RV manufacturers, RV dealerships, and more. Find a part-time seasonal job – If you have a job that gives you the summers off (or whatever season), then finding a part-time seasonal job might be one of the ways to make money while filling your time off. Some of the seasonal, part-time job options are listed below. Bartend – If you have bartending experience, then you may be able to find a bartending job at a bar, restaurant, catering company, and more. Since the hours for this are usually later at night and on the weekends, you will probably be able to find a bartending job that works well with a regular 9-5 job schedule. Work at a restaurant – You could be a host, wait tables, bus tables, and so on. You may even get to eat delicious food and receive a discount when dining out at the restaurant you work at. Substitute teach – I know quite a few people who substitute teach both part-time and full-time and love it. Sometimes the schedule can be tricky as you may be called at the last moment, but other times you may secure a long-term position. In some places, substitute teaching can pay around $100 per day. Teach during summer school – If you are a teacher, then spending part of your summer teaching summer school is a great way to make extra money. My brother-in-law is a teacher and he earns around $3,000 for just three weeks of work, and it isn’t even full days! He and his wife use that money to fund their summer vacations. Work at a hotel, motel, hostel, resort, etc. – There are many jobs in the hospitality industry. If you love meeting new people who are visiting your area, this can be one of the great ways to make money. When we were RVing, we met several RVers who make money at RV parks and campgrounds while they full-time RV. Work at a retail store – I worked in retail for over five years, made lifelong friends, and I was able to make an okay income to live off of. Plus, you can usually receive a good discount when working in retail. Lifeguard – You could lifeguard at a community pool, a private pool, a water park, and so on. You don’t have to be a teenager to lifeguard either! Deliver newspapers – Delivering newspapers can be a good way to make some side money. You may have to wake up early, but maybe those are the hours you are looking for. Run errands for others – Being someone’s assistant can be an interesting way to make money. Someone may pay you to do their laundry, clean their home, pick up their food, answer phone calls, and more. 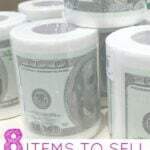 There are many ways to make money by selling items. We all have things around our homes that can be sold instead of collecting dust, or you can even search for items that can be bought and resold for a profit. Or, if you are trying to live a minimalist lifestyle, then knowing that you can make money selling your things might be the motivation you need to get started. If you want to learn how to make money on the side by selling your stuff, then continue reading below. Flip items – Melissa’s family was able to make $42,875 in one year through buying and flipping items for sale, and they were only working about 10-20 hours per week. Learn more in How Melissa Made $40,000 In One Year Flipping Items. Sell/donate blood, plasma, eggs, etc. – Yup, all of these can be sold for a price, and you can definitely make extra money by doing so. Women can earn anywhere from a few thousand dollars to $10,000 or more for their eggs, depending on their characteristics. Egg donors are typically under the age of 30 and healthy. African American women and Asian American women usually earn the most money as there is a larger need for their eggs. This is not easy money, though. There are a number of doctor visits, and extracting the eggs requires a medical procedure. For sperm, the average donation pays anywhere from $50 to $100. It can be quite easy to donate, and some men donate as often as 2-3 times each week. Sell items on eBay – Whether you have old clothes you want to sell, a car, electronics, and so on, eBay can be a great way to sell many different types of items. eBay also has a worldwide reach, which can be great if the market in your area isn’t large enough. I know many people who use this as one of the ways to make money online, and it’s very easy to get started. Sell items on Craigslist – Craigslist has gotten a bad rap in the past, but I have always had great success when I have bought or sold things through them. Craigslist can be a great way to sell your items, while often earning a higher value for them too. However, be safe, because you will have to meet with strangers to complete the transactions. Sell things on Facebook Marketplace – Facebook is a great place to sell your items to make extra money. You can find buyers in your area, but for larger items, like cars and furniture, buyers are often willing to travel. Plus, because you are probably already on Facebook, it can be one of the easier ways to make money online. Sell to second hand stores – There are many second hand stores out there that will take your clothing and shoes. Stores like Plato’s Closet, Hut No. 8, and Buffalo Exchange will pay you upfront for on-trend young adult clothing, and they take all of the legwork out of selling items, which is nice. There are also second hand stores for designer items, women’s clothing, children’s items, and more. Some pay upfront, whereas others may not pay you until after the item has sold. Sell on Etsy – Etsy is a great place to sell handmade items, vintage finds, and craft supplies. 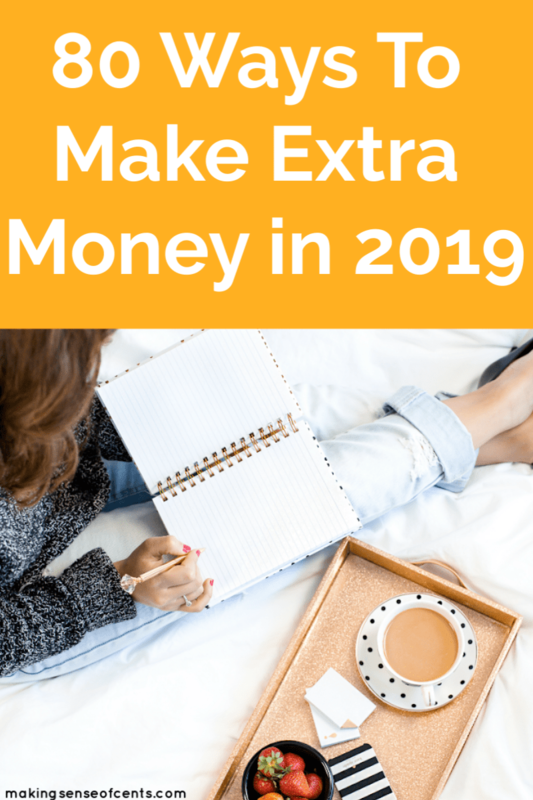 If you are a crafty person, definitely check out this website if you are looking for ways to make money in 2019. Sell your gift cards – If you have any gift cards in your wallet that you know you won’t use, you should think about selling them. There are many, many websites out there that will pay you cash for your gift cards. Some of the websites I know of are Gift Card Granny, Cardpool, and Raise. If you have unused gift cards sitting around your house, why not sell them as one of the ways to make money? Sell items through a garage sale – A garage sale can be an easy way to make extra money because people come straight to your house. The only downside is that you usually don’t make as much for your items as you would if you were to sell them on sites such as eBay, Craigslist, or Facebook Marketplace. Sell your old books – Back when I was in college, I would always sell my textbooks immediately after the class was over. This helped me regain the amount that I originally paid for the book. You can sell your books online, and most university bookstores have a buyback option. Make more money at the job you already have. If you’re already employed and not interested in learning ways to make money through starting a side hustle, online business, or taking part-time job, then you may want to see if you can earn more at the job you already have. Work overtime – One of the extra ways to make money at the job you already have is to see if your company will allow you to work overtime. In many cases, overtime is welcomed and you can earn a decent amount of money by doing so. Plus, what’s an extra hour or two when you’re already there? Ask for a raise – Asking for a raise may be the best way to make extra money at your current job, as the work is the same and you most likely won’t be adding additional hours to your work week. Many people never ask for a raise, which is money that may possibly be left on the table. Over numerous years, this can add up to a significant amount of income! Get a promotion – If a raise is not possible, then you may want to try for a promotion at your company that you know comes with a pay bump. There are sometimes when a company can only pay you so much for the job you currently have, but perhaps a promotion with different and/or additional job duties, a possible move, etc. may result in an increase in pay. Earn bonuses – Depending on the industry and the company you work at, you may be able to earn bonuses. Bonuses often come in large chunks which makes them ideal for paying off large amounts of credit card or student loan debt. Or, you could even invest your bonus to earn even more in the long run. 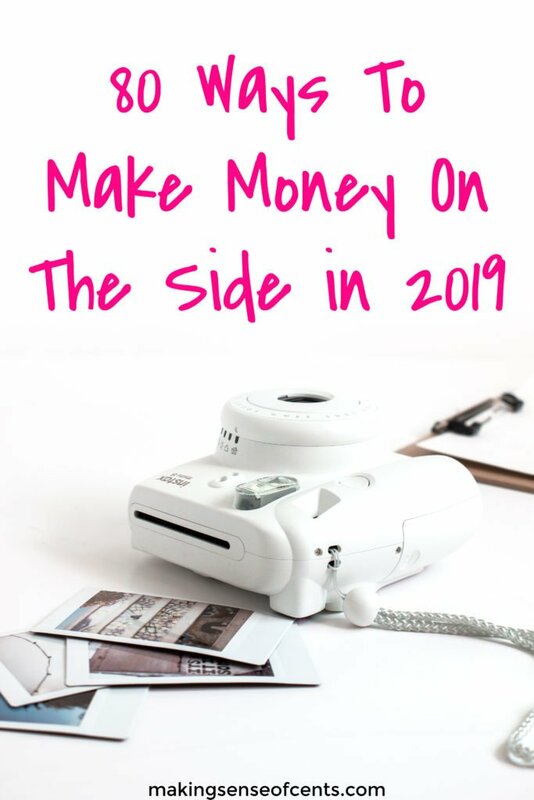 Interesting ways to make money in 2019. If you're looking for even MORE ways to make money on the side, then this is your spot. The things I will list below often aren’t what first comes to your mind when you are trying to make extra money, so they don’t fit into any of the categories that I listed above. I honestly love interesting and creative ways to make money because it shows you that there are really so many options out there. If there is something that you do to make money that is not on this list, please share in the comments below! Cuddle with strangers – Did you know that you can make money on the side by cuddling with people that you don't even know? Surprisingly, there are many cuddling companies out there, and this option seems to be growing more and more each year. You can sell cuddles to strangers, and some people even make a few hundred dollars a day by cuddling with others. I’m not sure if this is something I could do (haha! ), but I know there are people out there who are perfect for this option. Scoop poop – Okay, like picking up trash, this isn’t going to be the most glamorous job, but someone has to do it. This is definitely one of the more interesting ways to make money on the side. Write a book about something you love to do – Alyssa and Heath quit their jobs in 2014 to RV full-time. They used their experience RVing to write and publish a book that is making them over $200 a DAY in passive income. Read the full interview at How Alyssa Is Making $200 A DAY In Book Sales Passively. Place advertisements on your car, home, or even on your body – Yes, there are companies out there that will pay you to place an advertisement on your car, home, or even your body (such as a tattoo on your forehead). If there’s space on your car or your fence that you don’t mind placing an ad on, then look into this! Help crew a sailboat delivery – Because you need sailing experience to do this, this won’t be for everyone. But, if you know your way around a boat, then you may be able to make money delivering sailboats. Wes actually helped out on a couple of sailboat deliveries in the past year, and he traveled to many amazing places along the way, such as visiting several European countries. Be an extra in a movie or TV show – If there’s a movie or TV show that is being filmed near you, you could always apply to be an extra as one of the more interesting ways to make money. You won’t have to do much, and it could be a lot of fun, especially if you are able to meet someone famous! Write and self-publish romance novels – This probably isn’t something that many people ever think of as one of the ways to make money, but it is a growing and profitable industry. You can learn how Yuwanda Black, a freelance writer, started writing and self-publishing short romance novels in this interview. She earned over $3,000 in one month alone! Invest – There are no guarantees when it comes to investing, but you should always start sooner rather than later. If you are looking for a good investment platform, I recommend Motif. Motif Investing allows individuals to invest affordably. This approachable investing platform makes it easy to buy a portfolio of up to 30 stocks, bonds, or ETFs for just $9.95 total commission. Start investing with spare change – Investing through platforms like Acornsmakes investing even more approachable. You simply link your bank or credit cards and Acorns rounds every transaction up to the next dollar. Read more at How To Start Investing With Little Money. Sell breast milk – Only recently did I realize that some women make extra money doing this. If you are breastfeeding, then you may be able to sell your breast milk to make extra money. Breast milk often goes for $1 to $2.50 per ounce, and sometimes it sells for as much as $4 per ounce. There are many people who are looking to buy breast milk, not just mothers. Athletes, and those looking to boost their immune systems, are buyers as well. Receive bonuses and rewards for using a credit card – There are many credit cards out there that will give you cash back just for using them. If you are good with credit cards (please skip this if you are not), this is something to look into as you can make money without having to do much. Read more at How To Take A 10 Day Trip To Hawaii For $22.40 – Flights & Accommodations Included. Take part in medical research studies – Medical studies allow you to help with the research and study of diseases, medicines, treatments, and more. Studies ask for certain types of people for the different tasks needed to be performed. To find paid medical research studies, I recommend checking out your local Craigslist, contacting universities in your area, and seeing if there are any medical testing companies around you. Most cities have these options, and you just have to look for them. Use Ebates when shopping online – One of the easiest ways to make money on the side is to use a cashback website. If you shop online, you should always use a cashback website like Ebates so that you can earn free cash back and make extra money for the online shopping you already do. And, it doesn’t cost anything to use Ebates! To earn money through Ebates, all you have to do is just click on a link through their website that leads you to the store you are interested in shopping at. They earn money when you shop through their link, and they give you part of what they receive as a thank you. You can still use coupons and discounts when shopping as well, so it’s just an extra way to make money back on your purchases with very little work. You can sign up for Ebates here. Enter contests and giveaways – There’s no guarantee that you will win anything when entering contests, but it is possible to make money on the side by doing this. You may win cash, gift cards, vacations, electronics, and more. The key here is to enter as many as you can. One of the easiest ways to make money through this is to look at the back or bottom of your receipts, as many stores and restaurants have monthly or weekly giveaways that you can sign up for. Mystery shop – Yes, you can actually get paid to shop at stores and eat at restaurants. A few years ago, I mystery shopped a lot to make extra income. I made anywhere from $150 to $200 a month mystery shopping and received free meals, makeup, and more as a mystery shopper. I used Bestmark for mystery shopping, so I know that they are a 100% legitimate company. There are other legitimate mystery shopping companies that exist, but you do want to do your research if you are thinking about this as one of the ways to make money in 2019. Use InboxDollars – InboxDollars is an online rewards website I recommend if you want to find ways to make money on the side. You can earn cash by taking surveys, playing games, shopping online, searching the web, redeeming grocery coupons, and more. Also, by signing up through my link, you will receive $5.00 for free! Travel the world and be an au pair – In 2016, my sister was an au pair in Italy. It was an interesting experience, and she shares how you can become an au pair and travel the world in her blog post. Learn more at How To Become An Au Pair And Travel The World. Play video games on your phone – This is one is completely new to me, but you can earn money, even cryptocurrency by playing Long Game on your phone. Long Game was even listed as one of Forbes’ Startups Of The Week! To learn more, you can read my review at How To Earn Extra Money Playing Video Games On Your Phone. Earn money with your FitBit – Did you know that you can earn money, points, gift cards, and more with your FitBit? It’s true, you can! Read 4 Ways To Earn Money With A Fitbit to learn more about how to make money on the side with your FitBit. Are you interested in learning new ways to make money on the side? How could learning how to make money online or any of the other ways help you with your financial goals? This list is great Michelle, great post! I just started a blog about a month ago, and I’m really getting into it. I used your website as an inspiration, loving it! I hope to write an ebook in a few months when my traffic gets higher, but in the meanwhile I’m focusing on my blog. Thanks again for everything you do, it really helped me a lot! Thank you so much for sharing this helpful tips, Michelle. My focus is on how to make money online. To help me narrow it down, I focused on the insurance niche. My goal is to help in the digital marketing aspect of the insurance industry. There are some creative things on your list! I never knew you could make money from cuddling with strangers and earning money with your fit bit! Very extensive list! Thanks for sharing! Wow, great and long list Michelle. Thanks for sharing with us, always good to be/get inspired by others and having new ideas. This is a great list. I didn’t even know that you could make money from cuddling strangers. How odd! Exhaustive list! I must admit, I’ve really started looking into side projects recently. I started freelancing for clients last year alongside my full-time job. Even though it’s not a huge amount extra that I’m making it really makes a big difference. It also helped expand my own knowledge and gave me more confidence in my skills. Still working with my first client after 7 months and they’re happy which gives me a great sense of accomplishment and satisfaction. Entering contests and giveaways is something I’ve been doing for years and only recently started looking at as a side hustle! I’ve won over $3,000 in prizes in about 5 years and now I’m hoping to help others learn the tricks to win! Thanks. I’m doing this all wrong. I decided to wait until I was in my fifties to try to earn a living abroad. I have enough equity to buy a place in Taiwan, so I don’t need to earn a lot to make rent. I just need a small income. My plan was always to teach English, but now I am finding out most schools won’t hire you if you are over 50! So I need some alternatives. Thanks for getting my ideas flowing!